Kirk Cousins will get the start this weekend. There must be something in the water in Washington, because Mike Shanahan’s head is somewhere in the clouds. After the Redskins’ fifth straight loss on Sunday, Shanahan made an executive decision to bench second-year quarterback Robert Griffin III and start backup Kirk Cousins. Cousins will start on Sunday against the Atlanta Falcons, and Shanahan said that if he plays well enough, Cousins just might net the ‘Skins a first-round draft pick, according to The Washington Post. 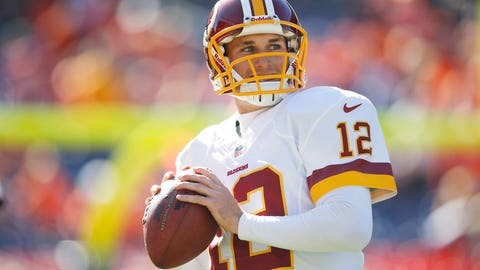 Never mind the fact that Cousins himself sat on the board until the fourth round in the 2012 NFL Draft, and played in just three games during his rookie season. "If he lights it up, hey, maybe we can bring a first-round draft choice back to this organization, and say ‘Hey, who are we gonna take in the first round?’ " Shanahan said. "And I think by him playing and Robert not playing, it gives us a chance to have a few options for our organization that we wouldn’t normally have, and the safety of our quarterback going into the offseason is preserved . . . And we’re still getting a chance to see a guy that we’ve got a lot of confidence in go out there and play. And his value can only go up. It cannot go down. It can only go up." The Redskins won’t have a pick in the first round of the 2014 or the 2015 draft, so garnering a first-round pick via trade for Cousins could be the perfect remedy for a team with glaring holes. It seems unlikely to happen, though, considering the fact that teams didn’t think Cousins had first-round talent to begin with. So the wishful thinking in Washington continues.